Last fall, I was invited by Jennifer Nelson, the director of Women, Gender and Sexuality Studies at the University of Redlands, to teach a class called Queer Cultures and Identities. As an alumna of the Johnston Center, teaching at the university was both somewhat surreal and also deeply gratifying. In the course, I asked my students to examine and challenge their ideas of norms, standards, roles, and expectations in society for them and others. For example, when I tell people that I am a professor, I often get puzzled looks. Being only a few years older than many of my students, and queer, places me outside what many students might expect in a professor. On the first day of class, I asked my students to come up with as many definitions as they could for the term “queer” and “culture.” This led to a discussion of the many meanings and constructions of these ideas. In each subsequent week, we collaboratively engaged with the material using a variety of avenues. 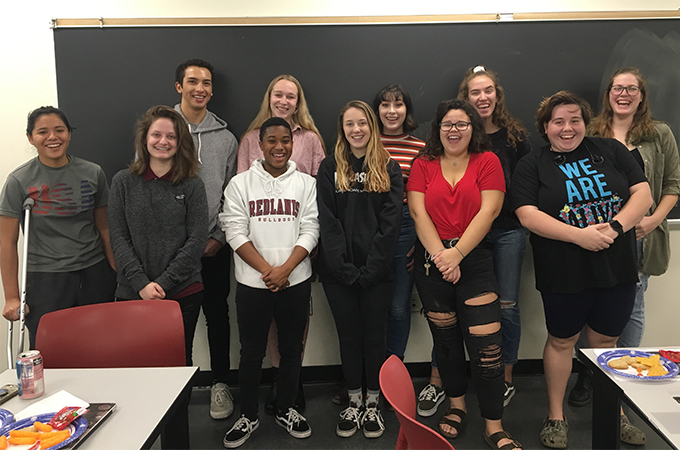 These included group work, development of activist campaigns, creation of zines, mapping of concepts and their connections to contrasting ideas, writing exercises, peer-review workshops, and critical theory/queer-themed trivia. As part of this lineup, I developed a scavenger hunt, which introduced students to important locations and resources across campus, while tying in our readings for that week. The students solved riddles, completed tasks in small groups, and talked to fellow students at the University about ideas from class. The students also followed clues to locations including the Bulldog Café; the Pride Center; the Women, Gender, and Sexuality Studies Department; and various faculty offices. The class culture my students and I developed shows that creative structures serve to engage every student and every learning style. The scavenger hunt demonstrates how learning can be continuous, creative, and live both inside and outside the classroom. Although my academic research centers on the class’s subject matter, each of my students helped me gain new understandings of the material and of teaching. I want to thank them for their engagement, creative and critical insights, and willingness to engage with material in new ways. I hope the experience will resonate beyond our class.